Pedestrians will be prohibited from using Jl. Jati Baru Raya, Central Jakarta, starting Feb. 7. The director of city-owned bus operator PT Transportasi Jakarta, Agung Wicaksono, explained that pedestrians were no longer allowed to pass through Jl. Jati Baru Raya or under the Tanah Abang multipurpose sky bridge. "Jl. Jati Baru Raya will be cleared from pedestrians," Agung said on Monday. PT Transjakarta, state-owned train operator PT Kereta Api Indonesia and commuter line operator PT Kereta Commuter Indonesia (KCI) cooperated to create the policy in order to support the implementation of integrated transportation system Jak Lingko around the Tanah Abang train station. The sky bridge includes entry and exit gates for a Transjakarta bus stop and a public minivan stop managed by Jak Lingko. 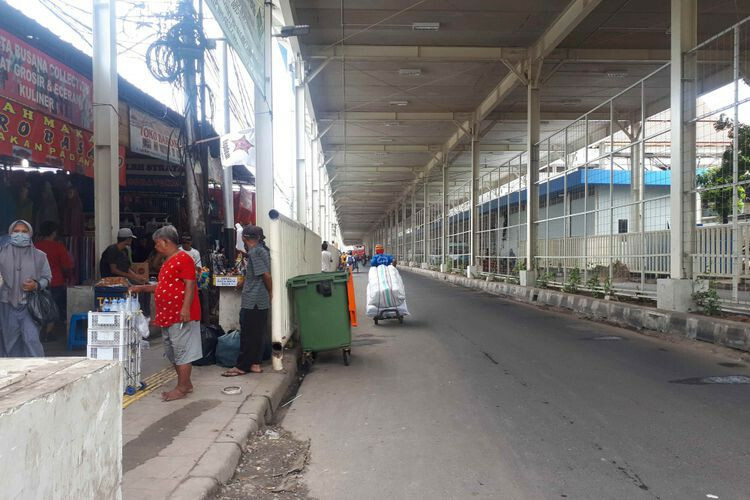 KCI president director Wiwik Widayanti said pedestrians looking to use the commuter line, Transjakarta buses or Jak Lingko public minivans could use stairs at the south side, or the old building, of the station. Passengers who order ride-hailing vehicles can access the exit gate at the north side, or the new building, of the station, which leads to Jl. Jati Baru Bengkel.